Day 1: Transfer from your hotel to the Quito airport is available for those guests who need it. At the airport, a La Selva representative will help you with your luggage and tickets. After a short (35 minute) flight to Coca, you will be met by another English-speaking representative of La Selva Amazon Ecolodge, who will welcome you to Coca, help you with your luggage and transfer you and your fellow guests to the pier, where our motorized canoe is waiting. 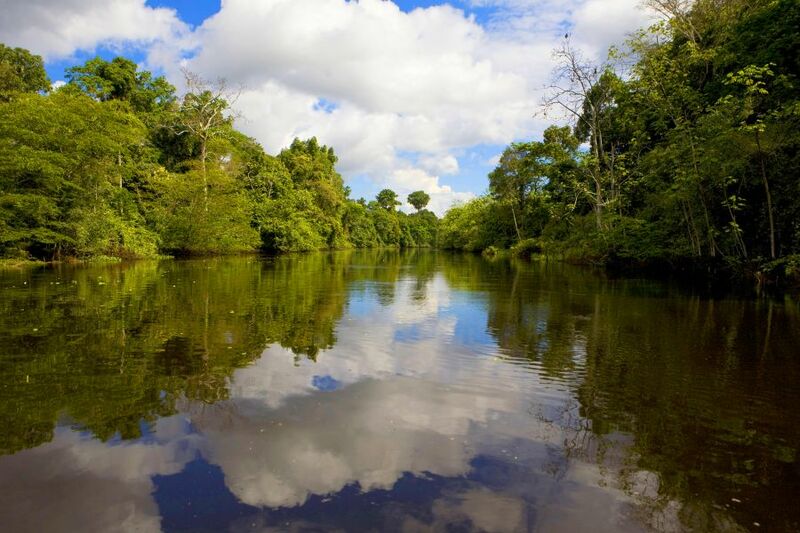 La Selva Lodge is located about two hours from Coca by motorized canoe. The canoe is covered, in a case of inclement weather such as rain or strong sunshine. The ride itself is fun and interesting! A box lunch is provided for guests on the ride. The motorized canoe cannot go into the lagoon where the lodge is located, so you will disembark on the river for a short walk and a ride in another, smaller canoe. Your luggage will be handled for you. Once you reach the lodge, there is a welcome cocktail and brief orientation meeting. Then you’ll be shown to your spacious rooms and given the chance to rest and explore a bit before dinner at 7:30. During dinner, your group and guide will discuss the activities for the following day. After dinner, depending on the weather and the will of the group, there may be a short activity such as night wildlife walk or canoe ride near the lodge to see some wildlife. Many guests prefer to relax in the lounge with a cold drink from the bar or have a soothing massage in the spa! Days 2 and 3: Exploring the Amazon Rainforest: Breakfast is served early because there is so much to see and do! Activities that you might do include a visit to the parrot clay lick, a trip to a local community, or an excursion to the observation tower to see birds and monkeys. For a partial list of the activities we offer, please see our activity page. What activity you do will depend on many factors, including the weather and what the group wants to do. If you do not wish to do the morning activity, you are under no obligation to do so. Many guests prefer to remain in our comfortable lodge and relax. A delicious lunch is served in our dining room at 12:30. After lunch, guests can try their hand at fishing for piranhas, take a nap or read a book during the hottest hours of the day. Afternoon activities tend to be more low-key than morning ones. You might go for a canoe ride around the lagoon, take a short trail to hopefully see pygmy marmosets, or visit the nearby butterfly farm if it is raining very hard. Again, the activity will be decided at the last moment by the guide, depending on conditions. A gourmet dinner awaits in our dining room as afternoon turns into evening. After dinner, depending on the weather and the will of the group, there may be a short activity such as night wildlife walk or canoe ride near the lodge to see some wildlife. Many guests prefer to relax in the lounge with a cold drink from the bar or have a soothing massage in the spa! On your last evening, you will be asked to clear up your bill in case you had any extras, such as alcoholic drinks or a massage. You’ll also leave tips if you wish for the staff and guides. You may use your credit cards. You’ll also be asked to kindly fill out a comment card so that we can improve our service. Day 4: Return to Quito: Although you must depart the lodge early in order to get to Coca in time for your flight, breakfast will be served before you leave. You’ll go out the way you came: a canoe ride, followed by a short walk, and then a two-hour ride on the motorized canoe to Coca. An English-speaking representative will accompany you. Once you reach Coca, you will be taken to the airport, checked in and directed to the waiting room for your return flight to Quito. Please inquire for availability and rates.